Interested in having some of our state of the art equipment for your home? Check out some of the products that we have to offer, and let us know if you're interested in renting or purchasing. Please fill out the contact form below for further information. One of our largest portable designs that serves as our most popular chamber amongst parents, physicians, celebrities and professional athletes. Enough room for two adults to self-treat simultaneously, the sizable 32” diametric chamber has complete freedom of movement for patients and maintains our strict and impeccable safety specifications. Strategically angled air-in port and tamper-proof redundant pressure regulators maintains consistent circulatory air flow within the chamber during treatments. 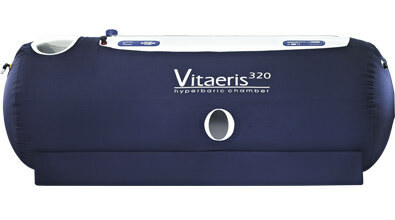 The Vitaeris320 is practical and ideal for clinics and homes as the roomy interior provides patients with peace of mind during treatments. Five patient viewing windows illuminate the interior with room light. The spacious design coupled with medical grade technology ensures durability and functionality that will last for years. Combining functionality and comfort with a 27” diametric design to provide patients with increased freedom of movement, yet small enough to fit into any room. Dual control valve technology for physician / self-treatment, in addition to double-sided 44 oz. urethane coated polyester offers an ergonomic design and more importantly impeccable safety specifications. One of our largest portable designs that serves as our most popular chamber amongst parents, physicians, celebrities and professional athletes. Enough room for two adults to self-treat simultaneously, the sizeable 32” diametric chamber has complete freedom of movement for patients and maintains our strict and impeccable safety specifications. There's no easier way to transition into a lifestyle that includes the benefits of far infrared sauna rays than with the Gentle Heatwave Far Infrared Sauna. Unlike conventional saunas we do not superheat the cabin, the air and you. Our sauna's unique angled front emitters produce invisible health rays at the perfect angle, so you experience a complete all over health benefit that gently penetrates deep into tissue, dissolving harmful chemicals accumulated in the body, in turn revitalizing your cells and your quality of life. Our light therapy systems combined a programmable controller and flexible neoprene LED pads. The systems have easy to use automatic and manual settings and the pads have unlimited positioning possibilities. Several LED light therapy pads may be placed on the body during one session to deliver therapy to multiple areas and straps may be used to hold them in place. Single, 3 port and 6 port controllers are available for with versions designed for both home or clinical use (up to 6 pads can be operated simultaneously). A range of frequencies adds to the therapy modalities.